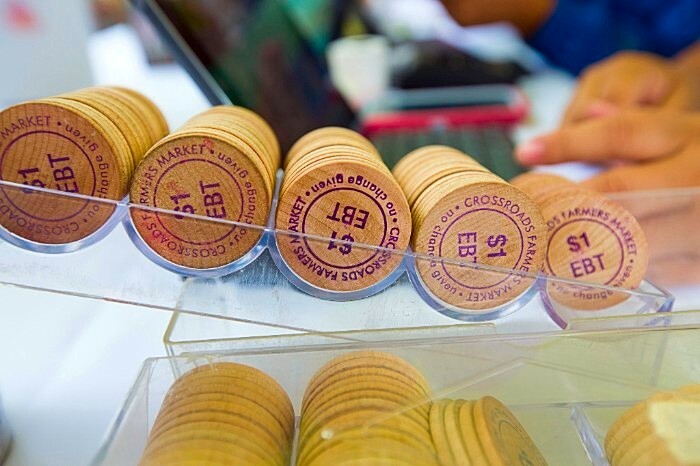 Watch our video to see Crossroads Farmers Market and our Fresh Checks program in action! The Takoma/Langley Crossroads, known as Maryland’s International Corridor, is home to residents from dozens of countries, including Guatemala, El Salvador, Honduras, Mexico, Colombia, Bolivia, Peru, Vietnam, India, Pakistan, Jamaica, Haiti, Ethiopia, Nigeria, and Côte d’Ivoire. Crossroads Farmers Market, a lively community gathering space for people of all backgrounds and incomes, was the first market in Maryland to accept federal nutrition benefits like SNAP and WIC, and the first in the country to launch a “double dollar” nutrition incentive program to match the value of these benefits spent at the market. Over the last 12 seasons, the market has experienced tremendous growth: More than $510,000 in incentives, called Fresh Checks, have been distributed to over 17,000 residents who’ve used them to buy fresh fruits and vegetables from local farmers. 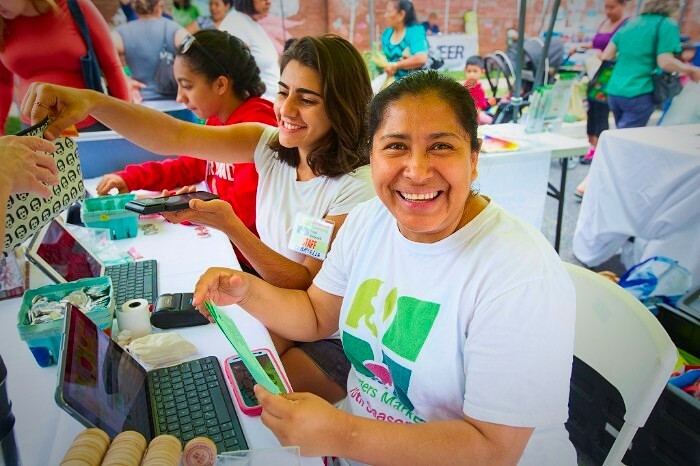 Crossroads’ success has garnered national press and sparked the creation of hundreds of similar programs at farmers markets across the country. 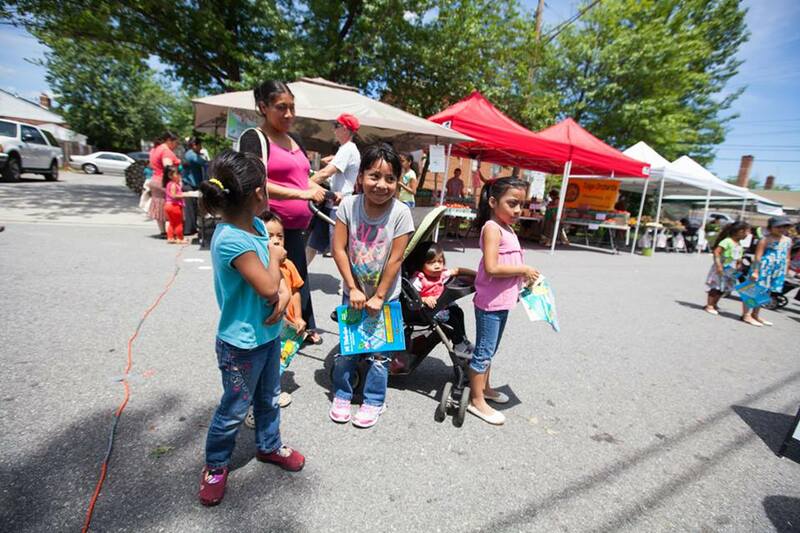 Crossroads Farmers Market accepts the following federal nutrition benefits: Supplemental Nutrition Assistance Program (SNAP, formerly known as food stamps); Women, Infant, Children Fruit and Vegetable Checks (WIC FVC); WIC/Senior Farmers Market Nutrition Program (FMNP), and DC WIC. Here’s how it works: SNAP shoppers can swipe their Independence Card at our Market Information Tent’s EBT machine, and we’ll match the amount spent up to $20 every week. WIC and senior shoppers can redeem their FVC and FMNP vouchers directly with the farmers, then get a matched amount (up to $20 every week) in Fresh Checks to buy more healthy food. Crossroads Farmers Market operates every Wednesday from mid-April through November in Takoma Park, Maryland. For hours, directions, and a map, please click here.